The BBC delivered its first continual public broadcast 80 years ago, that included coverage of the BBC Television Orchestra and famous musical comedy star Adle Dixon. This was a world first heralding the beginning of continuous broadcasting in the UK and kicking off the broadcast industry's constant search for new ways to improve the accessibility and quality of television content. Since then, the rate of change in television has shown no sign of abating, and the industry has continually evolved from the first use of color, to digital, to high definition. The consumer TV experience has changed beyond recognition from those early days. Now the industry is standing on the edge of the next developments in TV, the coming of age of 4K and the rapid approach of HDR. How are these advancements progressing and where is this taking the television industry? At the vanguard of the latest technological push in consumer television is 4K. The industry as a whole hasn't already bet on the new resolution, but many companies are upgrading their infrastructure. Sales of 4K sets already represent 40% of all sets being sold. As with HD, it is the production side of the business that is investing first, before content distributors. In anticipation of the upcoming format, content producers want to ensure their products have maximum shelf life and value in the future. Whilst the sales of consumer sets continue to grow, there remains uncertainty in the marketplace with content providers and consumers to the value 4K brings. Screen size and 'Smart TV features' are more likely to influence a consumer's buying decision. Whilst the value of 4K is unclear to traditional broadcasters, their hand may be forced by OTT providers such as Netflix who already provide a range of 4K content. This will inevitably drive consumer expectations for content they see on other services. For certain genres of content, there are broadcasters such as BT Sport and Sky who see 4K as an opportunity to differentiate their flagship sports programming. This will also drive consumer demand to have the same experience with other genres of content. While 4K is building up momentum, broadcasters are also having to consider High Dynamic Range ready equipment ahead of the next big step in television picture quality. With brighter whites and darker blacks, HDR footage is a step closer to what the human eye itself captures. The average consumer may struggle to notice the improvement in picture quality with the move from HD to 4K. The difference between the current generation of television sets and HDR enabled sets is a significant leap in picture quality and will be more enticing for consumers; this will inevitably be a key driver behind adoption. 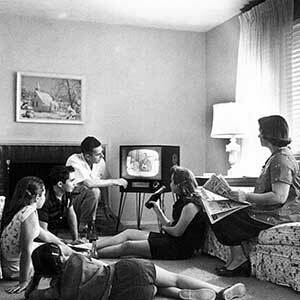 The last 80 years have elevated TV as a visual medium to a point where it has never been better able to entertain, educate and inform than it does right now. The next stage of technological developments is bringing TV yet closer to the consumer's real life view of the world and will make television more immersive. With the competition from OTT driving new formats and changes in how consumers access content, this rivalry will hopefully continue to drive improvements in the viewing experience forward over the next 80 years.